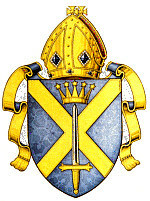 The Diocese of St Albans forms part of the Province of Canterbury in England and is part of the wider Church of England, in turn part of the worldwide Anglican Communion. The new diocese was founded relatively recently by an Order in Council on 4 May 1877, implementing the Bishopric of St Albans Act 1875. The diocese was established from parts of the large Diocese of Rochester, extending the new bishop’s jurisdiction over more than 600 parishes in the two counties of Essex and Hertfordshire. The first Bishop of St Albans was Thomas Legh Claughton, who served from 1877 to 1890. The see is in the City of St Albans, where the cathedra (bishop’s seat) is located in St Albans Cathedral. The cathedral building itself dates from 1077. It was an abbey church (part of St Albans Abbey) prior to its dissolution in 1539, and then a parish church (purchased by the town in 1553) until its elevation to cathedral status in 1877. In 1914, the new Diocese of Chelmsford was formed, removing Essex from the St Albans diocese. A few months later the county Archdeaconry of Bedford was added from the Diocese of Ely, thereby providing the diocese substantially with its current boundaries. The counties of Hertford and Bedford, though but comparatively recently joined together in the Diocese of St. Albans, were for many centuries closely connected with each other ecclesiastically. In fact it was probably only for seventy-seven years – between 1837 and 1914 – that the connection was broken. In the early days the greater part of the district was under missionary Bishops, the earliest of whom record is extant being Diuma, AD 656. Settled Diocesan rule dates from AD 679, when Mercia was divided into five Dioceses by Archbishop Theodore, viz. Lichfield, Leicester, Lindsey, Lincoln and Hereford. The succession of Bishops over the Counties of Hertford and Bedford can be traced from that point through Bishops of Leicester, Dorchester, Lincoln, London, Rochester and Ely. The suffragan bishopric of Bedford was revived in 1879 and again in 1935 and that of Hertford was created in 1968.